Wednesday February 5th 1890 Mother and I are both far from well. Will had intended to kill a hog today but we decided the weather was so warm and we felt so badly that he took it over in the afternoon and sold it. We ironed today and churned and did some baking in the afternoon Thursday February 6th 1890 I felt just wretched today and Mother not much better we managed to got through the work. Hatt came over to spend the evening and John came after her. I knit some in the eve. Friday February 7th 1890 I still feel badly. Will went to town soon after dinner and got me some medicine which I took right away. I helped got the supper and got things fixed for breakfast and went to bed early. weather rather cold again. Saturday February 8th 1890 I did not feel able to get up this morning and Mother and Winnie got the breaskfast. The Dr came over to see me about one oclock. I was up all the afternoon and the girls were over. weather quite pleasant. Sunday February 9th 1890 I felt some better this morning and done considerable work in the forenoon. After dinner Will and I read in our own room. and the same way in the evening. Monday February 16th 1890 It was a splendid day. I helped with the work in the forenoon and soon after dinner Will and I drove out to the west farm. We made a plan for the house and stopped at Viphers a few moments. We drove over town to get meat for supper. I knit in the evening. 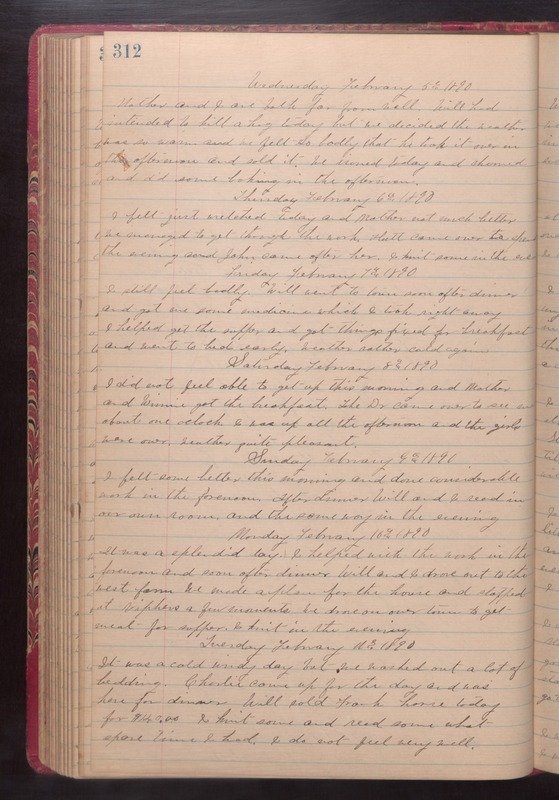 Tuesday February 11th 1890 It was cold windy day but we washed out a lot of bedding. Charlie came up for the day and was here for dinner. Will sold Frank horse today for $140.00. I knit some and read some what spare time I had. I do not feel very well.